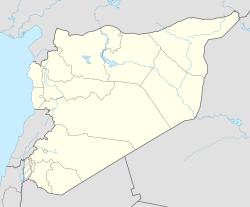 Mari (modern Tell Hariri, Arabic: تل حريري‎) was an ancient Semitic city in modern-day Syria. Its remains constitute a tell located 11 kilometers north-west of Abu Kamal on the Euphrates river western bank, some 120 kilometers southeast of Deir ez-Zor. It flourished as a trade center and hegemonic state between 2900 BC and 1759 BC. [note 1] As a purposely-built city, the existence of Mari was related to its position in the middle of the Euphrates trade routes; this position made it an intermediary between Sumer in the south and the Levant in the west. Mari was first abandoned in the middle of the 26th century BC but was rebuilt and became the capital of a hegemonic East Semitic state before 2500 BC. This second Mari engaged in a long war with its rival Ebla and is known for its strong affinity with Sumerian culture. It was destroyed in the 23rd century BC by the Akkadians, who allowed the city to be rebuilt and appointed a military governor bearing the title of Shakkanakku ("military governor"). The governors later became independent with the rapid disintegration of the Akkadian Empire and rebuilt the city as a regional center in the middle Euphrates valley. The Shakkanakkus ruled Mari until the second half of the 19th century BC, when the dynasty collapsed for unknown reasons. A short time after the Shakkanakku collapse, Mari became the capital of the Amorite Lim dynasty. The Amorite Mari was short-lived as it was annexed by Babylonia in c. 1761 BC, but the city survived as a small settlement under the rule of the Babylonians and the Assyrians before being abandoned and forgotten during the Hellenistic period. The Mariotes worshiped both Semitic and Sumerian deities and established their city as a center of old trade. 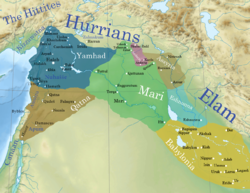 However, although the pre-Amorite periods were characterized by heavy Sumerian cultural influence, Mari was not a city of Sumerian immigrants but rather a Semitic-speaking nation that used a dialect similar to Eblaite. The Amorites were West Semites who began to settle the area before the 21st century BC; by the Lim dynasty's era (c. 1830 BC), they became the dominant population in the Fertile Crescent. Mari's discovery in 1933 provided an important insight into the geopolitical map of ancient Mesopotamia and Syria, due to the discovery of more than 25,000 tablets that contained important information about the administration of state during the 2nd millennium BC and the nature of diplomatic relations between the political entities in the region. They also revealed the wide trading networks of the 18th century BC, which connected areas as far as Afghanistan in Southern Asia and Crete in the Mediterranean region. The name of the city can be traced to Mer, an ancient storm deity of northern Mesopotamia and Syria, who was considered the patron deity of the city, Georges Dossin noted that the name of the city was spelled identically to that of the storm god and concluded that Mari was named after him. Mari is not considered a small settlement that later grew, but rather a new city that was purposely founded during the Mesopotamian Early Dynastic period I c. 2900 BC, to control the waterways of the Euphrates trade routes that connect the Levant with the Sumerian south. The city was built about 1 to 2 kilometers away from the Euphrates river to protect it from floods, and was connected to the river by an artificial canal that was between 7 and 10 kilometers long, depending on which meander it used for transport, which is hard to identify today. The city is difficult to excavate as it is buried deep under later layers of habitation. A defensive system against floods composed of a circular embankment was unearthed, in addition to a circular 6.7 m thick internal rampart to protect the city from enemies. An area 300 meters in length filled with gardens and craftsmen quarters separated the outer embankment from the inner rampart, which had a height of 8 to 10 meters and was strengthened by defensive towers. Other findings include one of the city gates, a street beginning at the center and ending at the gate, and residential houses. Mari had a central mound, but no temple or palace has been unearthed there. A large building was however excavated (with dimensions of 32 meters X 25 meters) and seems to have had an administrative function. It had stone foundations and rooms up to 12 meters long and 6 meters wide. The city was abandoned at the end of the Early Dynastic period II c. 2550 BC for unknown reasons. Around the beginning of Early Dynastic period III (earlier than 2500 BC) Mari was rebuilt and populated again. The new city kept many of the first city's exterior features, including the internal rampart and gate. Also kept was the outer circular embankment measuring 1.9 km in diameter, which was topped by a wall two meters thick capable of protecting archers. However, the internal urban structure was completely changed and the new city was carefully planned. First to be built were the streets that descended from the elevated center into the gates, ensuring the drainage of rain water. At the heart of the city, a royal palace was built that also served as a temple. Four successive architectural levels from the second kingdom's palace have been unearthed (the oldest is designated P3, while the latest is P0). The last two levels are dated to the Akkadian period. The first two levels were excavated; the findings include a temple named the Enceinte Sacrée,[note 2] which was the largest in the city but it is unknown for whom it was dedicated. Also unearthed were a pillared throne room and a hall with three double wood pillars leading to the temple. Six more temples were discovered in the city, including the temple called the Massif Rouge (to whom it was dedicated is unknown), and temples dedicated to Ninni-Zaza, Ishtarat, Ishtar, Ninhursag and Shamash. All the temples were located in the center of the city except for the Ishtar temple; the area between the Enceinte Sacrée and the Massif Rouge is considered to have been the administrative center of the high priest. The second kingdom appears to have been a powerful and prosperous political center, its kings held the title of Lugal, and many are attested in the city, the most important source being the letter of king Enna-Dagan c. 2350 BC,[note 3] which was sent to Irkab-Damu of Ebla,[note 4]. In it, the Mariote king mentions his predecessors and their military achievements. However, the reading of this letter is still problematic and many interpretations have been presented by scholars. The earliest attested king in the letter of Enna-Dagan is Ansud, who is mentioned as attacking Ebla, the traditional rival of Mari with whom it had a long war, and conquering many of Ebla's cities, including the land of Belan. [note 5] The next king mentioned in the letter is Saʿumu, who conquered the lands of Ra'ak and Nirum. [note 6] King Kun-Damu of Ebla defeated Mari in the middle of the 25th century BC. The war continued with Išhtup-Išar of Mari's conquest of Emar at a time of Eblaite weakness in the mid-24th century BC. King Igrish-Halam of Ebla had to pay tribute to Iblul-Il of Mari, who is mentioned in the letter, conquering many of Ebla's cities and campaigning in the Burman region. Enna-Dagan also received tribute; his reign fell entirely within the reign of Irkab-Damu of Ebla, who managed to defeat Mari and end the tribute. 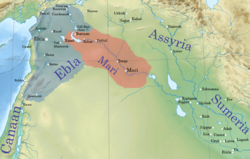 Mari defeated Ebla's ally Nagar in year seven of the Eblaite vizier Ibrium's term, causing the blockage of trade routes between Ebla and southern Mesopotamia via upper Mesopotamia. The war reached a climax when the Eblaite vizier Ibbi-Sipish made an alliance with Nagar and Kish to defeat Mari in a battle near Terqa. 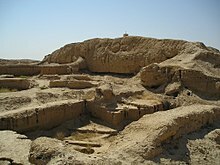 Ebla itself suffered its first destruction a few years after Terqa in c. 2300 BC, during the reign of the Mariote king Hidar. According to Alfonso Archi, Hidar was succeeded by Isqi-Mari whose royal seal was discovered. It depicts battle scenes, causing Archi to suggest that he was responsible for the destruction of Ebla while still a general. Just a decade after Ebla's destruction (c. 2300 BC middle chronology), Mari itself was destroyed and burned by Sargon of Akkad, Michael Astour give the date as c. 2265 BC (short chronology). Mari was deserted for two generations before being restored by the Akkadian king Manishtushu. A governor was appointed to govern the city who held the title Shakkanakku (military governor). Akkad kept direct control over the city, which is evident by Naram-Sin of Akkad's appointment of two of his daughters to priestly offices in the city. The first member of the Shakkanakku dynasty on the lists is Ididish, who was appointed in c. 2266 BC. [note 7] According to the lists, Ididish ruled for 60 years and was succeeded by his son, making the position hereditary. The third Mari followed the second city in terms of general structure, phase P0 of the old royal palace was replaced by a new palace for the Shakkanakku. Another smaller palace was built in the eastern part of the city, and contained royal burials that date to the former periods. The ramparts were rebuilt and strengthened while the embankment was turned into a defensive wall that reached 10 meters in width. The former sacred inclosure was maintained, so was the temple of Ninhursag. However, the temples of Ninni-Zaza and Ishtarat disappeared, while a new temple called the "temple of lions" (dedicated to Dagan), was built by the Shakkanakku Ishtup-Ilum and attached to it, was a rectangular terrace that measured 40 x 20 meters for sacrifices. Akkad disintegrated during Shar-Kali-Sharri's reign, and Mari gained its independence, but the use of the Shakkanakku title continued during the following Third Dynasty of Ur period. A princess of Mari married the son of king Ur-Nammu of Ur, and Mari was nominally under Ur hegemony. However, the vassalage did not impede the independence of Mari, and some Shakkanakkus used the royal title Lugal in their votive inscriptions, while using the title of Shakkanakku in their correspondence with the Ur's court. The dynasty ended for unknown reasons not long before the establishment of the next dynasty, which took place in the second half of the 19th century BC. Yahdun-Lim started his reign by subduing seven of his rebelling tribal leaders, and rebuilding the walls of Mari and Terqa in addition to building a new fort which he named Dur-Yahdun-Lim. He then expanded west and claimed to have reached the Mediterranean, however he later had to face a rebellion by the Banu-Yamina nomads who were centered at Tuttul, and the rebels were supported by Yamhad's king Sumu-Epuh, whose interests were threatened by the recently established alliance between Yahdun-Lim and Eshnunna. Yahdun-Lim defeated the Yamina but an open war with Yamhad was avoided, as the Mariote king became occupied by his rivalry with Shamshi-Adad I of Assyria, the son of the late Ila-kabkabu. The war ended in a defeat for Mari, and Yahdun-Lim was assassinated in c. 1798 BC by his possible son Sumu-Yamam, who himself got assassinated two years after ascending the throne while Shamshi-Adad advanced and annexed Mari. As Zimri-Lim advanced, a leader of the Banu-Simaal (Zimri-Lim's tribe) overthrew Yasmah-Adad, opening the road for Zimri-Lim who arrived a few months after Yasmah-Adad's escape, and married princess Shibtu the daughter of Yarim-Lim I a short time after his enthronement in c. 1776 BC. Zimri-Lim's ascension to the throne with the help of Yarim-Lim I affected Mari's status, Zimri-Lim referred to Yarim-Lim as his father, and the Yamhadite king was able to order Mari as the mediator between Yamhad's main deity Hadad and Zimri-Lim, who declared himself a servant of Hadad. Zimri-Lim started his reign with a campaign against the Banu-Yamina, he also established alliances with Eshnunna and Hammurabi of Babylon, and sent his armies to aid the Babylonians. The new king directed his expansion policy toward the north in the Upper Khabur region, which was named Idamaraz, where he subjugated the local petty kingdoms in the region such as Urkesh, and Talhayum, forcing them into vassalage. The expansion was met by the resistance of Qarni-Lim, the king of Andarig, whom Zimri-Lim defeated, securing the Mariote control over the region in c. 1771 BC, and the kingdom prospered as a trading center and entered a period of relative peace. Zimri-Lim's greatest heritage was the renovation of the Royal Palace, which was expanded greatly to contain 275 rooms, exquisite artifacts such as The Goddess of the Vase statue, and a royal archive that contained thousands of tablets. The relations with Babylon worsened with a dispute over the city of Hīt that consumed much time in negotiations, during which a war against Elam involved both kingdoms in c. 1765 BC. Finally, the kingdom was invaded by Hammurabi who defeated Zimri-Lim in battle in c. 1761 BC and ended the Lim dynasty, while Terqa became the capital of a rump state named the Kingdom of Hana. Mari survived the destruction and rebelled against Babylon in c. 1759 BC, causing Hammurabi to destroy the whole city. However, Mari was allowed to survive as a small village under Babylonian administration, an act that Hammurabi considered merciful. Later, Mari became part of Assyria and was listed among the territories conquered by the Assyrian king Tukulti-Ninurta I (reigned 1243–1207 BC). Afterward, Mari constantly changed hands between Assyria and Babylon. In the middle of the eleventh century BC, Mari became part of Hana whose king Tukulti-Mer took the title king of Mari and rebelled against Assyria, causing the Assyrian king Ashur-bel-kala to attack the city. Mari came firmly under the authority of the Neo-Assyrian Empire, and was assigned in the first half of the 8th century BC to a certain Nergal-Erish to govern under the authority of king Adad-Nirari III (reigned 810–783 BC). In c. 760 BC, Shamash-Risha-Usur, an autonomous governor ruling parts of the upper middle Euphrates under the nominal authority of Ashur-dan III, styled himself the governor of the lands of Suhu and Mari, so did his son Ninurta-Kudurri-Usur. However, by that time, Mari was known to be located in the so-called Land of Laqe,[note 14] making it unlikely that the Usur family actually controlled it, and suggesting that the title was employed out of historical reasons. The city continued as a small settlement until the Hellenistic period before disappearing from records. The founders of the first city may have been Sumerians or more probably East Semitic speaking people from Terqa in the north. I. J. Gelb relates Mari's foundation with the Kish civilization, which was a cultural entity of East Semitic speaking populations, that stretched from the center of Mesopotamia to Ebla in the western Levant. At its height, the second city was the home of about 40,000 people. This population was East-Semitic speaking one, and used a dialect much similar to the language of Ebla (the Eblaite language), while the Shakkanakku period had an East-Semitic Akkadian speaking population. West Semitic names started to be attested in Mari since the second kingdom era, and by the middle Bronze-Age, the west Semitic Amorite tribes became the majority of the pastoral groups in the middle Euphrates and Khabur valleys. Amorite names started to be observed in the city toward the end of the Shakkanakku period, even among the ruling dynasty members. During the Lim era, the population became predominantly Amorite but also included Akkadian named people,[note 15] and although the Amorite language became the dominant tongue, Akkadian remained the language of writing. 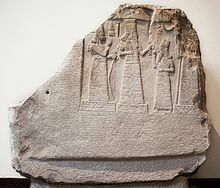 The pastoral Amorites in Mari were called the Haneans, a term that indicate nomads in general, those Haneans were split into the Banu-Yamina (sons of the right) and Banu-Simaal (sons of the left), with the ruling house belonging to the Banu-Simaal branch. The kingdom was also a home to tribes of Suteans who lived in the district of Terqa. Mari was an absolute monarchy, with the king controlling every aspect of the administration, helped by the scribes who played the role of administrators. During the Lim era, Mari was divided into four provinces in addition to the capital, the provincial seats were located at Terqa, Saggaratum, Qattunan and Tuttul. Each province had its own bureaucracy, the government supplied the villagers with ploughs and agricultural equipments, in return for a share in the harvest. The Sumerian King List (SKL) records a dynasty of six kings from Mari enjoying hegemony between the dynasty of Adab and the dynasty of Kish. The names of the Mariote kings were damaged on the early copies of the list, and those kings were correlated with historical kings that belonged to the second city. However, an undamaged copy of the list that date to the old Babylonian period was discovered in Shubat-Enlil, and the names bears no resemblance to any of the historically attested monarchs of the second city, indicating that the compilers of the list had an older and probably a legendary dynasty in mind, that predate the second city. The chronological order of the kings from the second kingdom era is highly uncertain; nevertheless, it is assumed that the letter of Enna-Dagan lists them in a chronological order. Many of the kings were attested through their own votive objects discovered in the city, and the dates are highly speculative. For the Shakkanakkus, the lists are incomplete and after Hanun-Dagan who ruled at the end of the Ur era c. 2008 BC (c. 1920 BC Short chronology), they become full of lacunae. Roughly 13 more Shakkanakkus succeeded Hanun-Dagan but only few are known, with the last known one reigning not too long before the reign of Yaggid-Lim who founded the Lim dynasty in c. 1830 BC. Tura Dagan, Shakkanakku of Mari. Originally from Mari (c. 2071–2051 BC). Anbu 30 years This name is also read as Ilshu. Anba 17 years His epithet was given as "the son of Anbu" on the list. Bazi 30 years His epithet was given as "the leatherworker" on the list. Zizi 20 years His epithet was given as "the fuller" on the list. Ikun-Shamash Reigned before the reign of Ur-Nanshe of Lagash. Ikun-Shamagan c. 2453 BC His name was inscribed on a votive statue offered by his official "Shibum". Ansud c. 2423–2416 BC His name is inscribed on a jar (as Hanusum) sent to Mari by Mesannepada of Ur. The name was read by Pettinato as Anubu. Saʿumu c. 2416–2400 BC He was attested in Enna-Dagan's letter as conquering many lands. Išhtup-Išar c. 2400 BC He was attested in Enna-Dagan's letter as conquering Emar and other Eblaite vassals. Ikun-Mari This name is inscribed on a jar in Mari. Iblul-Il c. 2380 BC He forced Ebla to pay tribute. Nizi His reign lasted three years. Enna-Dagan c. 2340 BC He wrote a letter to Irkab-Damu of Ebla to assert Mari's authority. Ikun-Ishar c. 2320 BC He is attested in the Eblaite archives. 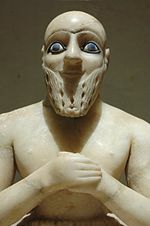 Hidar c. 2300 BC He is attested in the archives of Ebla, which was destroyed during his reign. Isqi-Mari His name was previously read as Lamgi-Mari. Hypothetically the last king. Shu-Dagan c. 2206–2200 BC He was the son of Ididish. Ishme-Dagan c. 2199–2154 BC He ruled for 45 years. Nûr-Mêr c. 2153–2148 BC He was the son of Ishme-Dagan. Ishtup-Ilum c. 2147–2136 BC He was the brother of Nûr-Mêr. Ishgum-Addu c. 2135–2127 BC He reigned for eight years. Apîl-kîn c. 2126–2091 BC He was the son of Ishme-Dagan. Was designated with the royal title Lugal in a votive inscription set by his daughter. Iddin-El c. 2090–2085 BC His name is also read as Iddi-Ilum; his name was inscribed on his votive statue. Ili-Ishar c. 2084–2072 BC His name is inscribed on a brick. Tura-Dagan c. 2071–2051 BC He was the son of Apîl-kîn and the brother of Ili-Ishar. Puzur-Ishtar c. 2050–2025 BC He was the son of Turam-Dagan. Used the royal title. Hitlal-Erra c. 2024–2017 BC He was the son of Puzur-Ishtar. Used the royal title. 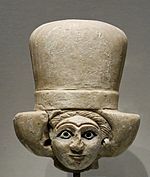 Hanun-Dagan c. 2016–2008 BC He was the son of Puzur-Ishtar. Used the royal title. Isi-Dagan c. 2000 BC This name is inscribed on a seal. Ennin-Dagan He was the son of Isi-Dagan. Itur-(...) This name is damaged, a gap separate him from Ennin-Dagan. Amer-Nunu This name is inscribed on a seal. Tir-Dagan He was the son of Itur-(...). Dagan-(...) This name is damaged and is the last attested Shakkanakku. Yaggid-Lim c. 1830–1820 BC He may have ruled in Suprum rather than in Mari. Yasmah-Adad c. 1796–1776 BC He was the son of Shamshi-Adad I of Assyria. Ishar-Lim c. 1776 BC He was an Assyrian official who usurped the throne for a few months between Yasmah-Adad's escape and Zimri-Lim's arrival. The first and second kingdoms were heavily influenced by the Sumerian south. The society was led by an urban oligarchy, and the citizens were well known for elaborate hair styles and dress. The calendar was based on a solar year divided into twelve months, and was the same calendar used in Ebla "the old Eblaite calendar". Scribes wrote in Sumerian language and the art was indistinguishable from Sumerian art, so was the architectural style. Mesopotamian influence continued to affect Mari's culture during the Amorite period, which is evident in the Babylonian scribal style used in the city. However, it was less influential than the former periods and a distinct Syrian style prevailed, which is noticeable in the seals of kings, which reflect a clear Syrian origin. The society was a tribal one, it consisted mostly of farmers and nomads (Haneans), and in contrast to Mesopotamia, the temple had a minor role in everyday life as the power was mostly invested in the palace. Women enjoyed a relative equality to men, queen Shibtu ruled in her husband's name while he was away, and had an extensive administrative role and authority over her husband's highest officials. The Pantheon included both Sumerian and Semitic deities, and throughout most of its history, Dagan was Mari's head of the Pantheon, while Mer was the patron deity. Other deities included the Semitic deities; Ishtar the goddess of fertility, Athtar, and Shamash, the Sun god who was regarded among the city most important deities, and believed to be all-knowing and all-seeing. Sumerian deities included Ninhursag, Dumuzi, Enki, Anu, and Enlil. Prophecy had an important role for the society, temples included prophets, who gave council to the king and participated in the religious festivals. The first Mari provided the oldest wheels workshop to be discovered in Syria, and was a center of bronze metallurgy. The city also contained districts devoted to smelting, dyeing and pottery manufacturing, charcoal was brought by river boats from the upper Khabur and Euphrates area. The second kingdom's economy was based on both agriculture and trade. The economy was centralized and directed through a communal organization, where grains were stored in communal granaries, and distributed amongst the population according to social statues. The organization also controlled the animal herds in the kingdom. Some people were directly connected to the palace instead of the communal organization, those included the metal and textile producers and the military officials. Ebla was an important trading partner and rival, Mari's position made it an important trading center as it controlled the road linking between the Levant and Mesopotamia. The Amorite Mari maintained the older aspects of the economy, which was still largely based on irrigated agriculture along the Euphrates valley. The city kept its trading role and was a center for merchants from Babylonia and other kingdoms, it received goods from the south and east through riverboats and distributed them north, north west and west. The main merchandises handled by Mari were metals and tin imported from the Iranian Plateau and then exported west as far as Crete. Other goods included copper from Cyprus, silver from Anatolia, woods from Lebanon, gold from Egypt, olive oil, wine, and textiles in addition to precious stones from modern Afghanistan. Mari was discovered in 1933, on the eastern flank of Syria, near the Iraqi border. A Bedouin tribe was digging through a mound called Tell Hariri for a gravestone that would be used for a recently deceased tribesman, when they came across a headless statue. After the news reached the French authorities currently in control of Syria, the report was investigated, and digging on the site was started on December 14, 1933 by archaeologists from the Louvre in Paris. The location of the fragment was excavated, revealing the temple of Ishtar, which led to the commencing of the full scale excavations. Mari was classified by the archaeologists as the "most westerly outpost of Sumerian culture". Since the beginning of excavations, over 25,000 clay tablets in Akkadian language written in cuneiform were discovered. Finds from the excavation are on display in the Louvre, the National Museum of Aleppo, the National Museum of Damascus, and the Deir ez-Zor Museum. In the latter, the southern façade of the Court of the Palms room from Zimri-Lim's palace has been reconstructed, including the wall paintings. Mari has been excavated in annual campaigns in 1933–1939, 1951–1956, and since 1960. André Parrot conducted the first 21 seasons up to 1974, and was followed by Jean-Claude Margueron (1979–2004), and Pascal Butterlin (starting in 2005). A journal devoted to the site since 1982, is Mari: Annales de recherches interdisciplinaires. Archaeologists have tried to determine how many layers the site descends, according to French archaeologist André Parrot, "each time a vertical probe was commenced in order to trace the site's history down to virgin soil, such important discoveries were made that horizontal digging had to be resumed." The tablets were written in Akkadian and they give information about the kingdom, its customs, and the names of people who lived during that time. More than 3000 are letters, the remainder includes administrative, economic, and judicial texts. Almost all the tablets found were dated to the last 50 years of Mari's independence (c. 1800 – 1750 BC), and most have now been published. The language of the texts is official Akkadian, but proper names and hints in syntax show that the common language of Mari's inhabitants was Northwest Semitic. Excavations stopped as a result of the Syrian Civil War that began in 2011 and continues to the present (2019). The site came under the control of armed gangs and suffered large scale looting. A 2014 official report revealed that robbers were focusing on the royal palace, the public baths, the temple of Ishtar and the temple of Dagan. ^ All of the dates in the article are estimated through the Middle chronology unless otherwise stated. ^ French name that means the sacred inclosure. ^ In old readings, it was thought that Enna-Dagan was a general of Ebla. However, the deciphering of Ebla's tablets showed him in Mari and receiving gifts from Ebla during the reigns of his Mariote predecessors. ^ Irkab-Damu is not named in the letter but it is almost certain that he was the recipient. ^ Located 26 km west of Raqqa. ^ Located in the Euphrates middle valley close to Sweyhat. ^ According to Jean-Marie Durand, this Shakkanakku was appointed by Manishtushu, other opinions consider Naram-Sin as the appointer of Ididish. ^ This ruled out the former theory that there was an abandonment of Mari during the transition period. ^ Suprum is 12 kilometers upstream from Mari, perhaps the modern Tel Abu Hasan. ^ It is not certain that Yaggid-Lim controlled Mari, however he is traditionally considered the first king of the dynasty. ^ The credibility of the tablet is doubted as it was written by Yasmah-Adad who was Ila-kabkabu grandson. ^ The transition of the Lim family from Suprum to Mari could have been the work of Yahdun-Lim after the war with Ila-kabkabu. ^ Although officially a son of Yahdun-Lim, in reality he was a grandchild or nephew. ^ An ancient designation for the land that include the confluence of the Khabur and the Euphrates rivers. ^ Jean-Marie Durand, although not speculating the fate of the East-Semitic population, believe that the Akkadians during the Lim dynasty are not descended from the East-Semites of the Shakkanakku period. ^ Gudug was a rank in the hierarchy of the Mesopotamian temple workers, a guduj priest was not specialized to a certain deity cult, and served in many temples. ^ a b Green 2003, p. 62. ^ Oldenburg 1969, p. 60. ^ a b c d e f Viollet 2007, p. 36. ^ a b c d e f g h i j k l Margueron 2003, p. 136. ^ a b c Margueron 2013, p. 520. ^ a b c d Akkermans & Schwartz 2003, p. 286. ^ Margueron 2013, p. 522. ^ a b Akkermans & Schwartz 2003, p. 267. ^ a b c d Liverani 2013, p. 117. ^ a b Margueron 2013, p. 523. ^ Margueron 2013, p. 524. ^ a b c d e f Margueron 2003, p. 137. ^ a b c Margueron 2013, p. 527. ^ Aruz & Wallenfels 2003, p. 531. ^ Nadali 2007, p. 354. ^ Frayne 2008, p. 335. ^ Michalowski 2003, p. 463. ^ a b Podany 2010, p. 26. ^ a b Roux 1992, p. 142. ^ a b Astour 2002, p. 57. ^ Matthews & Benjamin 2006, p. 261. ^ a b c d e f g h Liverani 2013, p. 119. ^ a b c d e f Astour 2002, p. 58. ^ Frayne 2001, p. 233. ^ Frayne 2008, p. 307–310. ^ a b Dolce 2008, p. 68. ^ a b Michalowski 2003, p. 462. ^ Podany 2010, p. 315. ^ a b Bretschneider, Van Vyve & Leuven 2009, p. 5. ^ a b Liverani 2013, p. 123. ^ Stieglitz 2002, p. 219. ^ a b Bretschneider, Van Vyve & Leuven 2009, p. 7. ^ Archi & Biga 2003, p. 33–35. ^ Astour 2002, p. 75. ^ Astour 2002, p. 71, 64. ^ Michalowski 1993, p. 83. ^ Leick 2002, p. 77. ^ a b c d e f g Oliva 2008, p. 86. ^ a b Leick 2002, p. 152. ^ Margueron 2003, p. 138. ^ a b c d e Margueron 2013, p. 530. ^ Suriano 2010, p. 56. ^ Strommenger 1964, p. 167. ^ Margueron 2013, p. 531. ^ Bryce 2009, p. xli. ^ Cooper 1999, p. 65. ^ a b c Wossink 2009, p. 31. ^ Tetlow 2004, p. 10. ^ Bryce 2014, p. 18. ^ a b Bryce 2009, p. 451. ^ Astour 2002, p. 127. ^ Astour 2002, p. 132. ^ Roux 1992, p. 188, 189. ^ a b c Frayne 1990, p. 597. ^ a b Astour 2002, p. 139. ^ Sicker 2000, p. 25. ^ a b DeVries 2006, p. 27. ^ Bryce 2009, p. 673. ^ a b c d e Porter 2012, p. 31. ^ Frayne 1990, p. 601. ^ a b Roux 1992, p. 189. ^ a b Feliu 2003, p. 86. ^ Frayne 1990, p. 603. ^ a b Frayne 1990, p. 606. ^ Fowden 2014, p. 93. ^ Bryce 2014, p. 19. ^ a b Pitard 2001, p. 38. ^ Van Der Meer 1955, p. 29. ^ Dale 2003, p. 271. ^ Frayne 1990, p. 613. ^ Bryce 2014, p. 20. ^ Van De Mieroop 2011, p. 109. ^ a b c d Tetlow 2004, p. 125. ^ a b Bryce 2009, p. 452. ^ Grayson 1972, p. 27. ^ Harris 2003, p. 141. ^ a b c d Hamblin 2006, p. 258. ^ Charpin 2011, p. 252. ^ Liverani 2013, p. 228. ^ a b Dalley 2002, p. 143. ^ Malamat 1980, p. 75. ^ Van Der Toorn 1996, p. 101. ^ Kupper 1973, p. 9. ^ Bryce 2009, p. 329. ^ Bryce 2009, p. 687. ^ Bryce 2009, p. 45. ^ Charpin 2012, p. 39. ^ Burns 2009, p. 198. ^ Gates 2003, p. 65. ^ Shaw 1999, p. 379. ^ Van De Mieroop 2007, p. 68. ^ Van De Mieroop 2007, p. 70. ^ Van De Mieroop 2007, p. 76, 139, 152. ^ Fleming 2012, p. 226. ^ a b Van De Mieroop 2007, p. 76. ^ a b c d e f g Bryce 2009, p. 453. ^ Dalley 2002, p. 201. ^ Bryce 2009, p. 408. ^ Hasselbach 2005, p. 3. ^ Van De Mieroop 2002, p. 133. ^ Chew 2007, p. 67. ^ McMahon 2013, p. 469. ^ a b Heimpel 2003, p. 21. ^ Haldar 1971, p. 8. ^ Liverani 2013, p. 222. ^ Heimpel 2003, p. 22. ^ Nemet-Nejat 1998, p. 114. ^ a b c d e f g Riehl et al. 2013, p. 117. ^ Michalowski 2000, p. 55. ^ a b Liverani 2013, p. 223. ^ Heimpel 2003, p. 26. ^ Finer 1997, p. 173. ^ a b Liverani 2013, p. 224. ^ Maisels 2005, p. 322. ^ a b Haldar 1971, p. 16. ^ Frayne 2008, p. 293–298. ^ a b Hamblin 2006, p. 244. ^ Frayne 1990, p. 593. ^ Bertman 2005, p. 87. ^ Kramer 2010, p. 329. ^ a b c d e Cohen 2013, p. 148. ^ Black et al. 2004, p. 112. ^ Cooper 1986, p. 87. ^ Frayne 2008, p. 299. ^ Frayne 2008, p. 315. ^ Frayne 2008, p. 333. ^ Frayne 2008, p. 337. ^ Frayne 2008, p. 339. ^ Heimpel 2003, p. 3. ^ Leick 2002, p. 81. ^ Leick 2002, p. 18. ^ Michalowski 1995, p. 187. ^ Leick 2002, p. 76. ^ Leick 2002, p. 78. ^ Leick 2002, p. 168. ^ a b c Oliva 2008, p. 91. ^ Oliva 2008, p. 92. ^ Leick 2002, p. 67. ^ Frayne 1990, p. 594. ^ Frayne 1990, p. 596. ^ Oliva 2008, p. 87. ^ Frayne 1990, p. 598. ^ Frayne 1990, p. 599. ^ Frayne 1990, p. 600. ^ Armstrong 1996, p. 457. ^ Chavalas 2005, p. 43. ^ Pardee & Glass 1984, p. 95. ^ Matthiae 2003, p. 170. ^ Pettinato 1981, p. 147. ^ Cohen 1993, p. 23. ^ Kramer 2010, p. 30. ^ a b Green 2003, p. 161. ^ Larsen 2008, p. 16. ^ Wossink 2009, p. 126. ^ Heimpel 2003, p. 29. ^ Grabbe 2004, p. 3. ^ Dougherty & Ghareeb 2013, p. 657. ^ Tetlow 2004, p. 84. ^ a b c Feliu 2003, p. 90. ^ Feliu 2003, p. 304, 171. ^ Smith 1995, p. 629. ^ Thompson 2007, p. 245. ^ a b Darke 2010, p. 293. ^ Feliu 2003, p. 92. ^ Feliu 2003, p. 170. ^ Nissinen, Seow & Ritner 2003, p. 79. ^ Walton 1990, p. 209. ^ Margueron 2013, p. 521. ^ Otto & Biga 2010, p. 486. ^ Liverani 2013, p. 126. ^ Aubet 2013, p. 141. ^ a b Teissier 1996, p. 6. ^ a b c Dalley 2002, p. 10. ^ Evans 2012, p. 180. ^ Gadd 1971, p. 97. ^ Malamat 1998, p. 45. ^ Frayne 1990, p. xxviii. ^ Gates 2003, p. 143. ^ Bonatz, Kühne & Mahmoud 1998, p. 93. ^ a b Daniels & Hanson 2015, p. 87. ^ Margueron 1992, p. 217. ^ Crawford 2013, p. xvii. ^ Dalley 2002, p. 2. ^ Heintz, Bodi & Millot 1990, p. 48. ^ Ochterbeek 1996, p. 214. ^ a b Fleming 2004, p. 48. ^ Feliu 2003, p. 63. ^ Gates 2003, p. 62. Archi, Alfonso; Biga, Maria Giovanna (2003). "A Victory over Mari and the Fall of Ebla". Journal of Cuneiform Studies. The American Schools of Oriental Research. 55. ISSN 2325-6737. Armstrong, James A. (1996). "Sumer and Akkad". In Fagan, Brian M. (ed.). The Oxford Companion to Archaeology. Oxford University Press. ISBN 978-0-19-507618-9. Aruz, Joan; Wallenfels, Ronald, eds. (2003). Art of the First Cities: The Third Millennium B.C. from the Mediterranean to the Indus. Metropolitan Museum of Art. ISBN 978-1-58839-043-1. Aubet, Maria Eugenia (2013). Commerce and Colonization in the Ancient Near East. Translated by Turton, Mary. Cambridge University Press. ISBN 978-0-521-51417-0. Chavalas, Mark (2005). "The Age of Empires, 3100–900 BCE". In Snell, Daniel C. (ed.). A Companion to the Ancient Near East. Blackwell Publishing. ISBN 978-1-4051-3739-3. Cockburn, Patrick (February 11, 2014). "The Destruction of the Idols: Syria's Patrimony at Risk From Extremists". The Independent. Retrieved January 6, 2017. Cohen, Yoram (2013). George, Andrew R. (ed.). Wisdom from the Late Bronze Age. Writings from the Ancient World. 34. Society of Biblical Literature. Atlanta. ISBN 978-1-58983-754-6.
Cooper, Jerrold S (1999). "Sumerian and Semitic Writing in Most Ancient Syro-Mesopotamia". In van Lerberghe, Karel; Voet, Gabriela (eds.). Languages and Cultures in Contact: At the Crossroads of Civilizations in the Syro-Mesopotamian realm. Proceedings of the 42th RAI. Orientalia Lovaniensia Analecta. 92. Peeters Publishers & Department of Oriental Studies, Leuven. ISBN 978-90-429-0719-5. Crawford, Harriet, ed. (2013). The Sumerian World. Routledge. ISBN 978-1-136-21912-2. Daniels, Brian I.; Hanson, Katryn (2015). "Archaeological Site Looting in Syria and Iraq: A Review of the Evidence". In Desmarais, France (ed.). Countering Illicit Traffic in Cultural Goods: The Global Challenge of Protecting the World's Heritage. The International Council of Museums. ISBN 978-92-9012-415-3. Dolce, Rita (2008). "Ebla before the Achievement of Palace G Culture: An Evaluation of the Early Syrian Archaic Period". In Kühne, Hartmut; Czichon, Rainer Maria; Kreppner, Florian Janoscha (eds.). Proceedings of the 4th International Congress of the Archaeology of the Ancient Near East, 29 March - 3 April 2004, Freie Universität Berlin. 2. Otto Harrassowitz Verlag. ISBN 978-3-447-05757-8. Dougherty, Beth K.; Ghareeb, Edmund A. (2013). Woronoff, Jon (ed.). Historical Dictionary of Iraq. Historical Dictionaries of Asia, Oceania, and the Middle East (2 ed.). Scarecrow Press. ISBN 978-0-8108-7942-3. Fleming, Daniel E. (2004). "Prophets and Temple Personnel in the Mari Archives". In Grabbe, Lester L.; Bellis, Alice Ogden (eds.). The Priests in the Prophets: The Portrayal of Priests, Prophets, and Other Religious Specialists in the Latter Prophets. T&T Clark International. ISBN 978-0-567-40187-8. Frayne, Douglas (2001). "In Abraham's Footsteps". In Daviau, Paulette Maria Michèle; Wevers, John W.; Weigl, Michael (eds.). The World of the Aramaeans. 1: Biblical Studies in Honour of Paul-Eugène Dion. Sheffield Academic Press. ISBN 978-0-567-20049-5. Gadd, Cyril John (1971). "The Cities of Babylonia". In Edwards, Iorwerth Eiddon Stephen; Gadd, Cyril John; Hammond, Nicholas Geoffrey Lemprière (eds.). Part 2: Early History of the Middle East. The Cambridge Ancient History (Second Revised Series). 1 (3 ed.). Cambridge University Press. ISBN 978-0-521-07791-0. Grabbe, Lester L. (2004). "Introduction and Overview". In Grabbe, Lester L.; Bellis, Alice Ogden (eds.). The Priests in the Prophets: The Portrayal of Priests, Prophets, and Other Religious Specialists in the Latter Prophets. T&T Clark International. ISBN 978-0-567-40187-8. Grayson, Albert Kirk (1972). Assyrian Royal Inscriptions. Records of the Ancient Near East. 1: From the Beginning to Ashur-Resha-Ishi I. Otto Harrassowitz Verlag. ISBN 978-3-447-01382-6. ISSN 0340-8450. Heimpel, Wolfgang (2003). Letters to the King of Mari: A New Translation, with Historical Introduction, Notes, and Commentary. Mesopotamian civilizations. 12. Eisenbrauns. ISBN 978-1-57506-080-4. ISSN 1059-7867. Heintz, Jean Georges; Bodi, Daniel; Millot, Lison (1990). Bibliographie de Mari: Archéologie et Textes (1933–1988). Travaux du Groupe de Recherches et d'Études Sémitiques Anciennes (G.R.E.S.A. ), Université des Sciences Humaines de Strasbourg (in French). 3. Otto Harrassowitz Verlag. ISBN 978-3-447-03009-0. Larsen, Mogens Trolle (2008). "The Middle Bronze Age". In Aruz, Joan; Benzel, Kim; Evans, Jean M. (eds.). Beyond Babylon: Art, Trade, and Diplomacy in the Second Millennium B.C. Metropolitan Museum of Art. ISBN 978-1-58839-295-4. Malamat, Abraham (1980). "A Mari Prophecy and Nathan's Dynastic Oracle". In Emerton, John Adney (ed.). Prophecy: Essays presented to Georg Fohrer on his Sixty-Fifth Birthday. Beihefte zur Zeitschrift für die Alttestamentliche Wissenschaft. 150. Walter de Gruyter. ISBN 978-3-11-083741-4. Malamat, Abraham (1998). Mari and the Bible. Studies in the History and Culture of the Ancient Near East. 12. Brill. ISBN 978-90-04-10863-9. ISSN 0169-9024. Margueron, Jean-Claude (1992). "The 1979–1982 Excavations at Mari: New Perspectives and Results". In Young, Gordon Douglas (ed.). Mari in Retrospect: Fifty Years of Mari and Mari Studies. Eisenbrauns. ISBN 978-0-931464-28-7. Margueron, Jean-Claude (2003). "Mari and the Syro-Mesopotamian World". In Aruz, Joan; Wallenfels, Ronald (eds.). Art of the First Cities: The Third Millennium B.C. from the Mediterranean to the Indus. Metropolitan Museum of Art. ISBN 978-1-58839-043-1. Margueron, Jean-Claude (2013). "The Kingdom of Mari". In Crawford, Harriet (ed.). The Sumerian World. Translated by Crawford, Harriet. Routledge. ISBN 978-1-136-21912-2. Matthews, Victor Harold; Benjamin, Don C. (2006) . Old Testament Parallels: Laws and Stories from the Ancient Near East (3 ed.). Paulist Press. ISBN 978-0-8091-4435-8. Matthiae, Paolo (2003). "Ebla and the Early Urbanization of Syria". In Aruz, Joan; Wallenfels, Ronald (eds.). Art of the First Cities: The Third Millennium B.C. from the Mediterranean to the Indus. Metropolitan Museum of Art. ISBN 978-1-58839-043-1. McLerran, Dan (September 13, 2011). "Ancient Mesopotamian City in Need of Rescue". Popular Archaeology Magazine. Retrieved January 6, 2017. McMahon, Augusta (2013). "North Mesopotamia in the Third Millennium BC". In Crawford, Harriet (ed.). The Sumerian World. Routledge. ISBN 978-1-136-21912-2. Michalowski, Piotr (1993). "Memory and Deed: The Historiography of the Political Expansion of the Akkad State". In Liverani, Mario (ed.). Akkad: the First World Empire: Structure, Ideology, Traditions. History of the Ancient Near East Studies. 5. Padua: S.a.r.g.o.n. Editrice Libreria. OCLC 32011634. Michalowski, Piotr (1995). Van Lerberghe, Karel; Schoors, Antoon (eds.). Immigration and Emigration Within the Ancient Near East: Festschrift E. Lipiński. Orientalia Lovaniensia Analecta. 65. Peeters Publishers & Department of Oriental Studies, Leuven. ISBN 978-90-6831-727-5. ISSN 0777-978X. Michalowski, Piotr (2000). "Amorites". In Freedman, David Noel; Myers, Allen C. (eds.). Eerdmans Dictionary of the Bible. Eerdmans Publishing. ISBN 978-90-5356-503-2. Michalowski, Piotr (2003). "The Earliest Scholastic Tradition". In Aruz, Joan; Wallenfels, Ronald (eds.). Art of the First Cities: The Third Millennium B.C. from the Mediterranean to the Indus. Metropolitan Museum of Art. ISBN 978-1-58839-043-1. Nemet-Nejat, Karen Rhea (1998). Daily Life in Ancient Mesopotamia. Daily Life Through History. Greenwood Press. ISBN 978-0-313-29497-6. ISSN 1080-4749. Nissinen, Martti; Seow, Choon Leong; Ritner, Robert Kriech (2003). Machinist, Peter (ed.). Prophets and Prophecy in the Ancient Near East. Writings from the Ancient World. 12. Society of Biblical Literature. Atlanta. ISBN 978-1-58983-027-1. Ochterbeek, Cynthia (1996). "Dan". In Berney, Kathryn Ann; Ring, Trudy; Watson, Noelle; Hudson, Christopher; La Boda, Sharon (eds.). Middle East and Africa. 4: International Dictionary of Historic Places. Routledge. ISBN 978-1-134-25993-9. Oliva, Juan (2008). Textos Para Una Historia Política de Siria-Palestina I (in Spanish). Ediciones Akal. ISBN 978-84-460-1949-7. Otto, Adelheid; Biga, Maria Giovanna (2010). "Thoughts About the Identification of Tall Bazi with Armi of the Ebla Texts". In Matthiae, Paolo; Pinnock, Frances; Nigro, Lorenzo; Marchetti, Nicolò; Romano, Licia (eds.). Proceedings of the 6th International Congress of the Archaeology of the Ancient Near East: Near Eastern archaeology in the past, present and future: heritage and identity, ethnoarchaeological and interdisciplinary approach, results and perspectives; visual expression and craft production in the definition of social relations and status. 1. Otto Harrassowitz Verlag. ISBN 978-3-447-06175-9. Pardee, Dennis; Glass, Jonathan T. (1984). "Literary Sources for the History of Palestine and Syria: The Mari Archives". The Biblical Archaeologist. The American Schools of Oriental Research. 47 (2). ISSN 2325-534X. Riehl, Simone; Pustovoytov, Konstantin; Dornauer, Aron; Sallaberger, Walther (2013). "Mid-to-Late Holocene Agricultural System Transformations in the Northern Fertile Crescent: A Review of the Archaeobotanical, Geoarchaeological, and Philological Evidence". In Giosan, Liviu; Fuller, Dorian Q.; Nicoll, Kathleen; Flad, Rowan K.; Clift, Peter D. (eds.). Climates, Landscapes, and Civilizations. Geophysical Monograph Series. 198. American Geophysical Union. ISBN 978-0-87590-488-7. ISSN 0065-8448. Roux, Georges (1992) . Ancient Iraq (3 ed.). Penguin Putnam. ISBN 978-0-14-012523-8. Shaw, Ian (1999). "Mari". In Shaw, Ian; Jameson, Robert (eds.). A Dictionary of Archaeology. John Wiley & Sons. ISBN 978-0-470-75196-1. Simons, Marlise (December 31, 2016). "Damaged by War, Syria's Cultural Sites Rise Anew in France". The New York Times. Retrieved January 6, 2017. Smith, Mark S. (1995). "The God Athtar in the Ancient Near East and His Place in KTU 1.6 I". In Zevit, Ziony; Gitin, Seymour; Sokoloff, Michael (eds.). Solving Riddles and Untying Knots: Biblical, Epigraphic, and Semitic Studies in Honor of Jonas C. Greenfield. Eisenbrauns. ISBN 978-0-931464-93-5. Stieglitz, Robert R. (2002). "The Deified Kings of Ebla". In Gordon, Cyrus Herzl; Rendsburg, Gary (eds.). Eblaitica: Essays on the Ebla Archives and Eblaite Language. 4. Eisenbrauns. ISBN 978-1-57506-060-6. Strommenger, Eva (1964) . 5000 Years of the Art of Mesopotamia. Translated by Haglund, Christina. Harry N. Abrams. OCLC 505796. Thompson, Thomas L. (2007). "A Testimony of the Good King: Reading the Mesha Stela". In Grabbe, Lester L. (ed.). Ahab Agonistes: The Rise and Fall of the Omri Dynasty. T&T Clark International. ISBN 978-0-567-04540-9. Van De Mieroop, Marc (2002). "Foreign Contacts and the Rise of an Elite in Early Dynastic Babylonia". In Ehrenberg, Erica (ed.). Leaving No Stones Unturned: Essays on the Ancient Near East and Egypt in Honor of Donald P. Hansen. Eisenbrauns. ISBN 978-1-57506-055-2. Van De Mieroop, Marc (2011) . A History of the Ancient Near East ca. 3000 - 323 BC. Blackwell History of the Ancient World. 6 (2 ed.). Wiley-Blackwell. ISBN 978-1-4443-2709-0. Van Der Meer, Petrus (1955) . The Chronology of Ancient Western Asia and Egypt. Documenta et Monumenta Orientis Antiqui. 2 (2 ed.). Brill. OCLC 4727997. Viollet, Pierre-Louis (2007) . Water Engineering in Ancient Civilizations: 5,000 Years of History. IAHR Monographs. 7. Translated by Holly, Forrest M. CRC Press. ISBN 978-90-78046-05-9. Wikimedia Commons has media related to Mari.